A new publication by the Anarchist Federation on ecology. 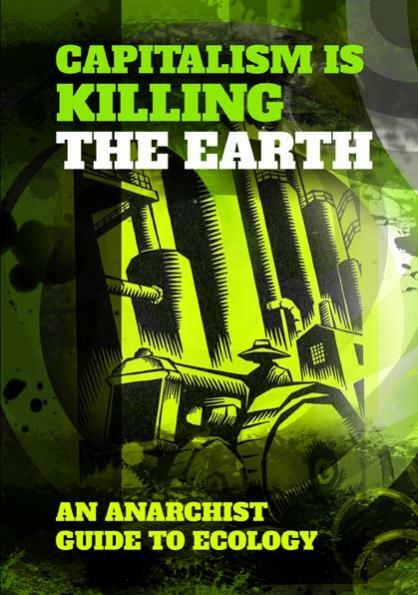 Capitalism is killing the earth: An anarchist guide to ecology. Originally published by the Anarchist Federation. Capitalism is Killing the Earth (PDF file). 40 pages. Print copies available soon at £3 here. If you find the PDF useful, and would like to donate to support our actions and publications you can do so here. We are in a period of crisis that we in MEDCs (More Economically Developed Country, EIE) cannot yet see. The signsare there if you look hard enough but at the moment the water is still flowing, the crops are still reliable the ski lifts are still running. The first wave of climate refugees are trying to make their way into Europe but they are being dismissed as ?economic migrants? or those displaced by war. In all likelihood, MEDCs will not feel the effectsof climate change for some time; our relative wealth will push the impacts onto those who haven?t the means to adapt or whose local climates were less temperate to begin with. The longer we wait to act, however, the bigger the coming crunch will be. Collectively, MEDCs are responsible for the overwhelming majority of cumulative carbon emissions and will have to radically change their energy and transport systems if an ecological disaster is to be avoided. Who will bear the brunt of the costs and who will get rich from this process is sadly predictable. The working class in MEDCs and most people in LEDCs (Less Economically Developed Country, EIE) will pay for the fossil fuel addiction and growth-at-all-costs model of the capitalist system. We have already begun to see this happen in the black, working-class communities devastated by natural disasters in the USA and flooding killing thousandsin Bangladesh. Capitalism relies on constantly increasing accumulation of profits. This has been achieved historically by appropriations (a polite term for thefts) both internal and external to the nation state. Internally, in Europe from the fifteenth century onwards, thishas followed the model of stealing common land from the people to create a proletarian class dependent on wage labour to support itself. Externally, this expansion was tied to a move outside Europe’s borders to exploit natural resources and labour in other locations. Thus colonialism and capitalism were, from the beginning, linked to processes of resourceextraction and accumulation. Capitalism is now in crisis; with so few areas beyond its reach, there are no easy sources of growth to appropriate, and the ability of the earth?s ecosystems to accommodate further growth is being seriously questioned. How then to continue growth and profit? In MEDCs, we are seeing a fresh attack on workers? rights, with more precarious jobs, lower pay and poorer social care. In LEDCs, the neoliberal development model is pushed with privatisation and financial deregulation extracting the most profit for the capitalists. We write thispamphlet to discuss the environmental problems that capitalism has created, with a focus on climate change and the false solutions offered up to us. There has been wider understanding of environmental issues since mainstream publications such as Silent Spring, Gaia and An Inconvenient Truth; however, an anti-capitalist critique has been lacking.